“The Elysian Fields?” – Taylor Bonnyman’s “graceful and intimate dining room”, tucked away in Chelsea offers an “exemplary experience”, which for all-round quality and consistency has few rivals in the capital. “Phenomenal cooking” – from either the prix fixe or tasting menu – is delivered by “faultless, thoroughly attentive yet unpretentious” staff and “a contented buzz in the room ensures the ambience is never hushed”. “The epitome of fine dining, minus the stuffiness” – Taylor Bonnyman’s “unflashy and grown-up” three-year-old, “tucked way in Chelsea” offers “an all-round fantastic experience”. The setting is “elegant”, service “genuine and unpretentious”; while the cuisine is “truly exceptional – exciting, yet accessible and (most importantly) delicious” (“expect an astonishing array of amuse bouches”). Until October 2016, this was perhaps “Michelin’s most shocking omission”, but finally the tyre men divvied up the requisite star. “It just gets better and better!” – Taylor Bonnyman’s “grown up” and “romantic” two-year-old in the heart of Chelsea is one of London’s most deeply impressive all-rounders – service is “impeccable”, and the “exciting” cuisine provides “a beautiful blend of original flavours”. 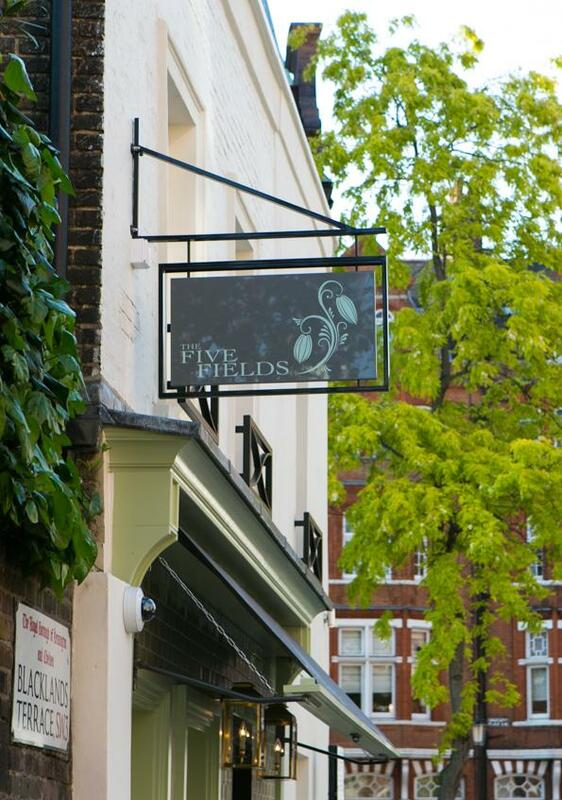 Have you eaten at The Five Fields? Taking inspiration from the seasons, dishes reflect the aesthetics of nature and are a snapshot of the current landscape while the design of the dining room has taken inspiration from the original green fields between Chelsea and Knightsbridge where once there was open space and fresh produce taken in to London. Named after John Rocque, an 18th century cartographer whose wonderfully detailed panels offer a glimpse of Georgian London where this area is referred to as â€œThe Five Fieldsâ€; The Rocque Room can accommodate up to 10 guests for Lunch or Dinner. Located on the first floor of the restaurant and overlooking the charming side streets of Chelsea, The Rocque Room is decorated in warm subtle tones and offers a view into our extensive Wine Cellar as well as a feature fire place. Guests may choose between two of the Chefâ€™s set menus, which are offered along with a number of additional indulgences including canapÃ©s, amuse-bouche, tea, coffee and petit fours. A cosy lounge adjoins The Rocque Room and is available for drinks to welcome your guests before dining or after your meal. Reviews of The Five Fields Restaurant in SW3, London by users of Hardens.com. Also see the editors review of The Five Fields restaurant. "One look at the tasting menu and the choice was made. As is the norm these days there was a minimum of information about the ingredients and the style of preparation, but it was clear that nothing would not be to our taste. It was very comfortable in the good open dining room and for a change we were not assailed by piped music, the professional staff made us feel at home immediately, especially our excellent sommelière, and we were served not only very good canapés, cod mousse in a wafer tube and ham and piccalilli dumplings, but also an amuse-bouche of well-tempered cheese custard with salt-baked kohlrabi, carrot and soup - none of which formed part of the tasting menu, a traditional approach to the start of a meal which some other top restaurants could learn from. Now it was on to the eight-course tasting menu proper - a rhubarb cornet with braised asparagus and razor clam combined with Cornish scallop was followed by new season Wye valley asparagus in a bone marrow emulsion and oyster with an asparagus salad served in a wafer. Then the first in a sequence of supremely good offerings - freeze-dried raspberries with beetroot purée and a seaweed wafer backing up delicious foie gras and amazing smoked eel cubes that were absolutely out of this world with the purée. Quality continued at this high level on the next course in the form of brilliant crispy Cornish cod enhanced with garlic, brown butter and mussel sauce, mussels and roast cauliflower. Not content with this, the kitchen then assailed our palates with a terrific pairing of morels stuffed with duck offal, backed up with a super duck jus and broccoli. Herefordshire beef then put in an appearance, our short rib melting in the mouth, tasting just as it should and benefiting from a touch of luscious fat, some lightly cooked turnip crisp in red wine sauce and slightly salty nasturtium leaves making this dish one to savour and remember. The pre-dessert/palate cleanser, a caramel wafer with cucumber sorbet and pink grapefruit, worked perfectly and set us up nicely for the yummy chocolate, fruity gel and crunchy, honeycomb-like hazelnut biscuit. We were not prepared for Five Fields to be as good as this. We now have yet another delightful London addition to our list of restaurants to return to." "A very pleasant welcome from the all boy crew. A stab at the lunchtime tasting menu proved a big hit and we lanced our way through all the courses. Even a request to change one of the items off the set menu on to our tasting menu was not a problem to the highly polished kitchen team. Exquisite presentation on knick knacks and creative crockery added to the sensory delights. Our two bottles of wine chosen were competitively priced for a restaurant of this calibre. To finish on a chocolate note is a rarity for us as we do not normally choose a chocolatey dessert. However we were both bowled over with the chocolate display and delightful surprise as we spooned our way into a cylinder of heaven. My only gripe would be the chairs which either cause you to slouch back or sit bolt upright. Shut the front door!!" "Amazing food both in taste and presentation.There were many small items with unusual flavour combinations with clearly a huge amount of attention to detail and the wine matches were very interesting. The staff were attentive and informative and the ambience was calm and intimate. We would definately visit again when in the area." "This was a long overdue return to The Five Fields but I have to say it was definitely worth the wait as it turned out to be a truly fabulous evening. We've been here twice before but the last time was over two and a half years ago and I can honestly say it won't be anywhere near as long before we're back again. Set just of the Kings Road and only a short walk from Sloane Square tube station is where you'll find the restaurant. As you enter the restaurant you immediately get a lovely homely feeling along with a warm and very friendly greeting. As you look into the dining area you see the tables down each side are set out for couples where each person faces inwards. There are larger tables down the centre plus upstairs is a Private Dining Room. Once seated we were treated to a delightful glass of Welsh Sparkling Rose from the Ancre Hill Estates. We also enjoyed some amazing snacks while we looked at the menu. On this occasion we decided to opt for the eight course Tasting Menu. It was then time to meet the wonderful sommelier Anna who it was a pleasure to chat to throughout the evening. Regarding our choice of wine we said that we would like to just have a bottle than the matched wine option to which Anna recommended a fabulous Riesling Trocken from Germany which was an absolute delight and really matched each course nicely. Now onto the food itself and we started with a stunning Scallop with Tomatillo & Lime this was followed by a heavenly Lobster with Fennel & Lardo. These dishes were brought to us by our Spanish waitress Lourdes who was so friendly and professional and truly added to our magical evening The next two courses were equally fantastic. The first being an amazing Beef Tartare with Mushroom followed by a simply stunning Foie Gras with a Beetroot Brioche & Blackberries Before we got to the main course we had the pleasure of a beautiful Turbot dish which came with Seaweed & Garlic So now it was time for the mains to which there was a choice of two. One being Roe Deer served with Courgette & Potato and the other was Grouse which came with Pumpkin & Girolles. We decided to have one dish each and can honestly say they were both worthy of being the highlight dish of the evening as they were just amazing Before dessert we decided to opt for a cheese course which apart from one French cheese the rest were British & Irish. The cheese was nicely presented to us by our delightful waitress Lourdes We then had a pre dessert which was a fabulous Melon with Hazelnut & Orange. This led us into our last course a delightful dessert of Honey , Lemon & Tarragon and the Sweet Wine chosen by Anna a Vouvray from the Loire Valley matched the dessert beautifully This brought an end to an outstanding evening where the food , wine and service was of the highest order and will definitely go down as one of the highlights of the year. Therefore I would highly recommend that you put a visit to this restaurant very close to the top of your list and as I said at the beginning it certainly won't be very long before I return"
"Eating here is an EVENT. The food is beautifully presented and staged. The service is as it should be- unobtrusive, but available and watchful without hovering. Best trained staff I have seen in years. Well choreographed. The food is excellent and the lagniappe was a wonderful complement to the courses. Cannot wait to come back." Post your own review of The Five Fields and contribute to our annual restaurant review guide.